Located on a solitary peninsula, Kalutara is an ideal location to host a destination beach wedding. 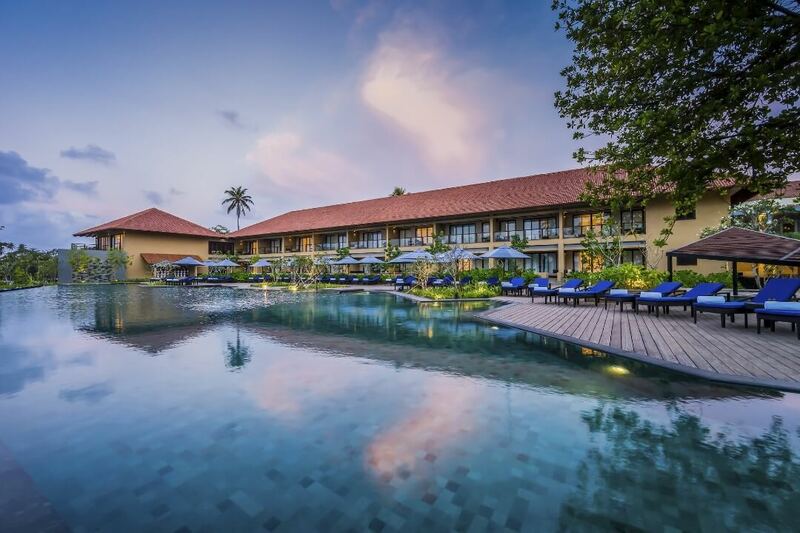 Surrounded by vibrant gardens and beaches fringed by palm trees, contemporary architecture, and delectable local cuisine, Kalutara is one of the most sought-after wedding destinations in Sri Lanka. Being in proximity with the nation’s capital by rail or bus, Kalutara is the perfect venue for destination weddings. Hosting a destination wedding in Kalutara is an unparalleled experience. One of the most popular attractions that Sri Lanka has to offer, Kalutara consistently draws large crowds due to its rich, coastal splendour and close proximity with the nation’s capital Colombo by land or rail. There are frequent trains which take about 1.5 hours to reach the city, while a large number of local taxis are also available to ferry you to Kalutara in 90 minutes from Colombo’s Bandaranaike International Airport. There is an assortment of luxurious wedding venues in Kalutara - from plush resorts ensconced in tropical gardens and private peninsulas to beach side properties and old-world style boutique hotels. One can host an exchange of wows discreetly or plan a formal corporate event in Kalutara at one of the lavish banquet halls in Kalutara. Or execute the perfect wedding reception in Kalutara at one of its gorgeous 5 star hotels with private beaches. Event management companies in Kalutara offer more than just what meets the eye – one can discover a great deal about the island’s culture, heritage and natural beauty. The beautiful Calido beach, the Kalutara Fort, the KosgodaTurtle Hatchery, the Thudugala Falls, and the Kalutara Church are exquisite wonders to visit on your downtime here. The best time to visit would be from December through April, as the rest of the months witness heavy showers. The official language spoken in Kalutara is Sinhalese and Tamil with Sri Lanka Rupee being the currency used as a mode of exchange. Wedding planners in Kalutara offer much to do in this sleepy seaside town. In addition to the natural bliss, guests can indulge in relaxing spa sessions, or pick from an array of outdoor activities like windsurfing, canoeing, a boat safari down the Kalu Ganga River, and much more besides. To get around the town, you can consider walking to certain points depending on where you are staying. If not, you can also hail a tuk-tuk to travel like a local! A melting pot of diverse flavours, Kalutara offers a range of seafood and local drinks to savour and a quaint market to indulge in some shopping of local textiles and spices at. So what are you waiting for? Discover and shortlist from the venues WOW Venue has curated for you below to host your own Sri Lankan affair. It’s one thing to host a grand event at a banquet hall, but an experience when hosting it at a 5 Star banquet hall. With the best of services, amenities, ambiance and more,5-star hotels banquet halls ensure any occasion or event will always to be a grand success. With large Indian weddings signifying endless days of celebrations with scores of guests attending from outstation cities, 5 Star Wedding Venues are the perfect option for accommodation as well as celebration. 5 Star Wedding Hotels serve the purpose of the occasion without any hassles and are ideal for guests to enjoy their stay and the event. Royal, romantic, and grand-scale weddings are brought to life by meticulous planning and thoughtful service at 5 star hotels banquet halls. Often managed by the best in the industry, 5 star hotels with banquet halls make all dreams come true. The buzzing city of Mumbai has several options to go for, with big names as the Leela, Novotel, Courtyard by Marriott, ITC Grand Central, Hilton, Four seasons, The Lalit & many more to choose from. Be it weddings, corporate events, business meetings, cocktail parties & soirees or bachelor parties and reunions, look no further than 5 star hotels banquet halls to celebrate the event in luxury and comfort with the best in a perfect ambience. There are just few things to take care of while booking a 5 star hotel banquet. In terms of the facilities and amenities, 5 star hotels with banquet halls will guarantee premier and incomparable services. Listed below are just a few points to consider while booking 5 star hotels banquet hall for your event. With much to do at Indian weddings, involving days of celebrations, rituals or functions, planning and executing a wedding is no easy task. With many considerations to keep in tab in order to make an event successful, the task can be quite daunting for the couple and their families. Here is where a wedding planner or a dedicated manager looking into every aspect of the occasion comes in. A dedicated manager at the 5 star hotel banquet hall establishes all the necessary details to host a successful event. The number of guests expected is crucial to planning the layout of the seating arrangements at the 5-star hotel banquet hall. A banquet style seating, often used for gala dinners & weddings is a popular choice where food is served individually or from a buffet. A reserved seating for guests makes sure that guests mingle among each other. 5 star hotel banquet menus are often being prepared by the best in the industry who are a talented team of chefs, offering a wide array of choices. The same can be overwhelming for most events along with its gracious servings that could be the key ingredient for a successful occasion. Then there are beverages - refreshing concoction of fruit drinks, freshly brewed coffee or hard liquor. 5 star banquet halls make sure that the best is served along with any special requests the clients may have. Once the selection of banquet hall is done from the options available at the 5-star hotel, consider & book rooms at the venue for the attending guests, along with other amenities available at the hotel. Most 5 star hotels already have the best of architectural form & pre-planned space, requiring little to no decor. However, with decoration and planning being trend-led, themes of all sorts have been seen at various occasions to personalise the event on a grand scale. Decor at 5 star hotels has got a classier and swanky more vibe that glamorizes any event. Perfect for ambience and candid shots. More often than most, 5 star hotel banquet halls have special package deals, inclusive of all necessary services or more at fixed price. Further discounts & other perks are available if accommodation and other services available at the venue are used together. Do keep a lookout for special deals during festivities and special occasions. Don’t forget to avail special spa packages available at the venue too. Taking care of guests’ needs and requirements with any assistance they may require goes a long way in marking an occasion favourably. A dedicated concierge service at the 5 star hotel takes care of the same and should never be overlooked. Entertainment in the form of live music, performances & other always makes a difference. Find out interesting deals the 5 star hotels may provide in terms of the best in entertainment aspects to liven up your event.